Grand Rapids, MI : Zondervan Publishing House, 1993. 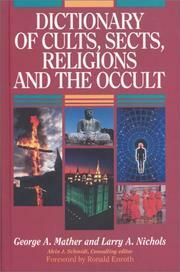 Dictionary of cults, sects, relgions and the occult. George A. Mather and Larry A. Nichols. 100 ME:PersonalName 0 $a Personal name Mather, George A. 245 Title 10 $a Title Dictionary of cults, sects, relgions and the occult. 300 Physical Desc $a Extent 384 p.
650 Subj:Topic 0 $a Topical term Cults--dictionaries. 650 Subj:Topic 0 $a Topical term Religions--dictionaries. 650 Subj:Topic 0 $a Topical term Sects--dictionaries. 700 AE:PersName 0 $a Personal name George A. Mather and Larry A. Nichols.